I purchased this car used in 2009 with around 18k. Didn't really have time to comparison shop as my previous car (1995 Nissan Sentra GLE) was just about done for. There have been some positive aspects of owning this car, but I can't say that I've enjoyed the ride. Too many random noises and irritations have me ready to get rid of it asap. 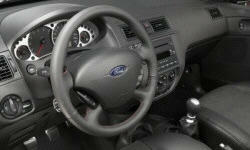 Why the 2007 Ford Focus? I have a 30 mile per direction commute to work, so fuel economy was of utmost importance. This car gets better than average fuel economy because it is very lightweight. However, I average around 32mpg highway (80% highway) and around 21mpg city (20% city). This is not the purported 38/29 highway/city mpg that was advised at the time of purchase. This car has been very reliable. I have driven it hard and fast on a daily basis and have only had a few minor mechanical problems. At 45k the alternator needed replaced and the steering fluids replaced, but it was covered under the extended warranty I purchased, so I didn't have to pay a thing other than labor costs and the usual 45k checkup costs. At 68000 miles the transmission had to be flushed and fluids replaced--not covered by warranty, cost about 280usd. I consider these minor costs for upkeep, considering the use this car has seen, and the car runs perfectly after these repairs. If you plan to buy this car, get the extended warranty offered by the dealer, or purchase one on your own. Even if you have your car regularly maintained as recommended by Ford, you never know if or when there might be a potentially costly repair, so the warranty is a great value even if you never end up needing it. Routine maintenance has not been terribly expensive, even at the dealership, but those extra little problems can hurt if not covered by warranty. In four years I have added over 60,000 miles to the odometer and never had a problem with reliability. I have had to replace the battery twice, but that's to be expected in an extreme climate like where I live. Also had the problems previously mentioned. I had a rug get caught in one of my tires when I was driving and the tire caught fire, but by some miracle there was no other damage to the car or the electrical system. Of course I did have to buy new tires, but I needed to anyway. Other than extremely uncomfortable seats (ie, very hard) and persistent road noise on the highway, the car drives nicely in good weather. It's almost fun! Very responsive and quick, almost sporty. Just be aware that if there is a strong wind or ice and snow on the road this car is going to feel very unstable and you'll have to try very hard to keep it on the road. Also, you'll need new tires every 25-30k miles or so. 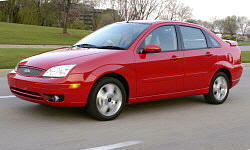 Why Not the 2007 Ford Focus? What can I say, it's a cheap car. At the time I purchased in 2009, the car was almost three years old and still had a sale price of $13000. It's currently only worth less than half of what was paid four years later. I purchased this car because of need and very limited time to make a choice. I knew I didn't want another Nissan because of their weak engines. My sister had just bought the 08 Focus SE model a few months before and was happy with hers, so I thought this might be an okay choice. Read on. As stated, this is a cheap car. Other than the engine block and frame, the car is built of cheap materials and it shows. A car that is only seven years old should not be falling apart on the inside! I am a single person, no kids, no family to haul around, and I take very good care of my car and keep it clean--and the seats, front armrest console, and plastics on the dash look worn out or have broken. Also, there are numerous noises that occur when the accelerator is pressed down even slightly, and the repair shop is not able to determine the cause or stop it from happening. Also, Ford kind of skimped on the safety features, so if you have a side-impact wreck, the odds are good you will have some serious injuries. I would not recommend this car for families with kids over the age of five, as there are no head restraints in the back seats. This car is not cute...not even close! Besides, it is a very common car in the area where I live, so I always had trouble locating my car in the parking lot. That is, until the rear spoiler broke off and then I could spot my car by the funky marks and holes in the deck lid. Not smooth at all! Even with brand new tires and shocks, you are going to feel every bump, pothole and ripple in the road. Beware: Extreme road noise at speeds 55mph and higher. Sometimes I can barely hold a conversation with any passengers because it is so loud, like riding in a plane. I usually have to blast the radio to drown out the noise.